Founding member of SAE at the University of Nebraska, Eugene Pace, was the quarterback of the 1982 football team. Sigma Alpha Epsilon was installed at the University of Nebraska in 1893 when the University was in its 24th year of existence. One of the first four fraternities on campus, our fraternity first lived at 307 North 24th Street, then moved to 229 North 17th Street. 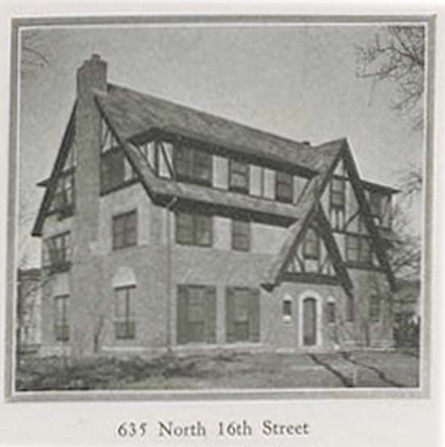 In 1928, our current home was constructed at 635 North 16th Street. The home is a brilliant example of English Tudor style and stands 2 1/2 stories tall. J. B. Miller and Fritz Craig, the most prolific designers of NU fraternities and sororities were architects. Ernest Rokahr & Sons Construction was the builder (Ernest’s son Jack Rokhar later become a SAE graduating in 1948). The House underwent its first renovation in 1939 adding two southern bays (the trophy and card rooms). A second major renovation occurred in 1968. It added added approximately 8400 square feet including the second living room, library and TV room along with the back stairwell. The second and third floors of the House were completely remodeled and central air was added. The House was renovated again in 2017. The $2.5 million effort refreshed and modernized the House while maintaining its historic look and design. The SAE House is a landmark in the heart of Greek row and is registered on the list of Historical Places. The first members of Sigma Alpha Epsilon at the University of Nebraska were campus leaders and some members of the University’s football and baseball teams. 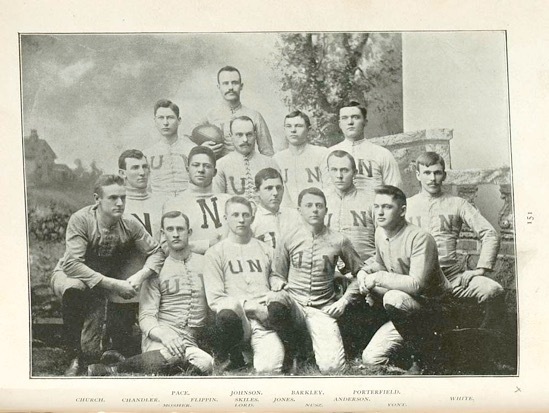 The original eight are Willard Bross, Clarence Tefft, Ernest Haughton, Willits Sawyer, Charles Gund, George Avery, Frank Hadley and Eugene Pace quarterback of Nebraska’s Bugeater football team). Since then, generations of SAE’s have pushed our accomplishments and contributions to new heights. SAE’s have been campus leaders, Homecoming Kings, star athletes on Husker teams and noted scholars. SAE Sam Francis was an, All-American football player and Olympic shot putter. 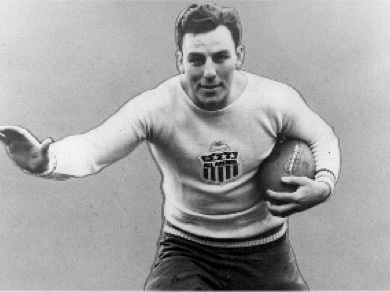 He was the Heisman Trophy runner-up in 1936 and finished 4th in the shot put at the 1936 Olympics in Berlin. The largest social fraternity in North America, Sigma Alpha Epsilon Fraternity was founded on March 9th, 1856 at the University of Alabama and was the first fraternity founded in the South. The leader of the eight Founders, Noble Leslie DeVotie, a charismatic young man and quite well respected by his peers, was also the first man to lose his life in the Civil War. Since our founding more than 155 years ago, more than 302,000 gentlemen have taken up the ΣAE mission—more than any other collegiate National Fraternity. On March 7, 2014 the National Leadership of Sigma Alpha Epsilon announced and became the first Fraternity to return to our original membership model with the elimination of the system of pledging. New young men recruited for membership will now be initiated within 3-4 days of receiving their invitation to join the Fraternity and over the course of their collegiate involvement will participate in educational programming that meets the changing needs of each student as they grow and mature through the organization. Today, ΣAE has more than 13,000 undergraduate members spread across some 245 chapters and college campuses within the United States and Canada. Each member is proud to uphold the ideals set forth by the Founders and documented in the ΣAE creed.